900mdpl is an extensive site-specific art project in Kaliurang, a small village on the southern slope of an active stratovolcano, Mt.Merapi, in Yogyakarta – Indonesia. Kaliurang is an hour drive from the city of Yogyakarta with an average altitude of 900 meters above sea level. Historically, Kaliurang was built as a resort area for Dutch geologists during the colonial period; enjoying its heyday until the end of the New Order era—and is still an important base for volcanologists to monitor the activity of Mt.Merapi. 900mdpl aims to respond to the spaces, collect stories, and revisit local wisdoms while promoting on knowledge exchange and community engagements through collaborative projects and public programs. 900mdpl consists of two parts: first, the residency period resulting in different solo projects by each of the artists; second, the grand project presentation of all artists at scattered sites around Kaliurang where a wider audience will be guided on the exhibition walking route. This text aims to revisit the long slow walk of creating the 900mdpl; a site-specific project which started from the residency period in early 2014, all the way through to the final presentation in November 2017. This part is where the personal note begins. Kaliurang is a place where I was born and raised, and has been the home of my ancestors for at least seven generations—up until this day. We grew up with family myths about the spirits of ancestors who guard Mt.Merapi, stories of fish that blinks, a man who got lost because of the enchanting spells of the forest fairies, and the white tiger that warns mountain climbers when they are about to cross dangerous path. At night, I would get shiver listening to the stories of banaspati that chase people who point the torchlight to the treetops or wewe that enjoys kidnapping children who still play outside when the sun is setting down. We know that somewhere deep inside the forest behind our home in Kaliurang, magic creeps secretly under the spell of the mighty kingdom of Mt.Merapi. Kaliurang for me is never just a place: it is also composed of stories. Behind the surface of what is seen, each place is heavy with collective memories, spirits, myth, absences of things which used to be, and invisible identities of the visible. In De Certeau’s words, “Stories are becoming private and sink into the secluded place in the neighbourhoods, families, or individuals […] while memories are a sort of anti-museum: it is not localizable.” Yet, the invisible builds up into layers and layers which make up a place. There must be a strange spell in the air that keeps people coming back. A family member once warned me to be careful, because those who get too comfortable in Kaliurang will be bounded there for a lifetime. As a response, I let myself wander and escape each time there is a chance; but escape is always an act of returning. Travel (like walking) is a substitute for the legends that used to open up space to something different—the return to nearby exoticism by way of a detour through distance places. Each time when I return from my erratic escape, I invite someone (an artist, musician, historian, etc.) for a residency to explore whether my fascination of this place is sharable. The residency itself is a slow developing process which started in early 2014. The slowness is one of the visible qualities of Kaliurang that I implemented in curating 900mdpl. Away from the hustle bustle of the city of Yogyakarta; Kaliurang is the place where quiet streets are surrounded by lush greenery, cool air, tranquillity, and only the faint sound of the neighbour chit-chats flowing with the wind every now and then. The 900mdpl residency series has taken place between 2014-2016; and during this period I have invited each of the artists involved to stay in my house in Kaliurang for two-weeks up to three-months. 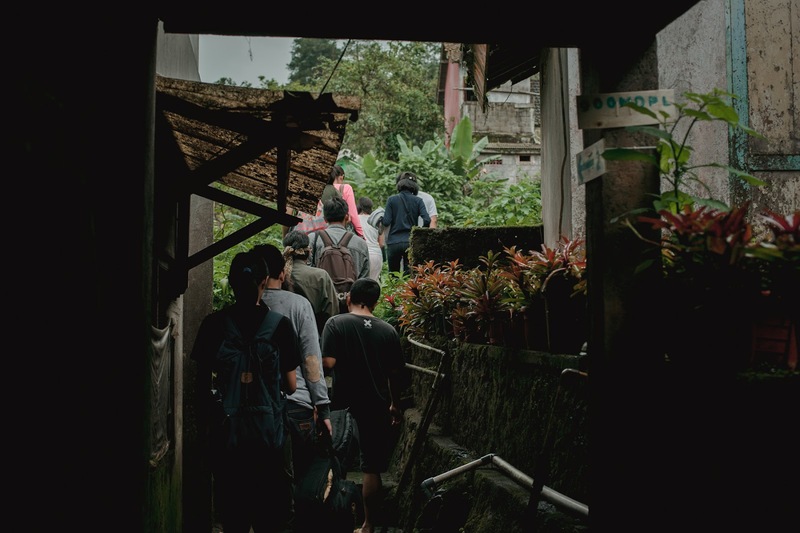 Some artists involved in this project, who live in the neighbouring city of Yogyakarta and are familiar with Kaliurang, chose to regularly commuting between the city and Kaliurang due to its proximity and only staying in for few intensive nights at a time. To open up a private house and share it with other people for a long period of time can be challenging. It requires trust, comfort, intimacy, and openness. This is applied not only in the physical presence of the house and the role of the host in welcoming the guest; but also in its non-physical present of the stories and local legends— whether or not the host, the native people of Kaliurang, are willing to share the stories to the visitors. Stories can be very personal and openness allows one to become vulnerable. This required generosity on the part of the people and in the other side of the exchange, the artist needs to earn the trust of the local people, observe the invisible features, and work within the mundane of everyday life. Within this project walking was the central research methodology— the artists were free to explore and observe through walking around the neighbourhoods in Kaliurang; the practice of walking operates both as poetic practice and as an anthropological observation of the space; tracing fragments, spatializing personal experiences, and stopping every now and then to connect with the community through social interaction. Trust, apparently, is something easily given to me as a native by the local community. My rootedness in the site (Kaliurang) was not something I had either courage or intention to reveal. I was concerned that I could be too close, too deeply rooted, and too biased to create a project out of a place that is so intimate and personal to me. At this point, the conversation about cultural identity and roots as capital begins. In this case, my position as a native was something I considered a privilege as a host: something to always be conscious about and to only use in moderation. The depth of my roots in Kaliurang can be viewed as a useful source of local knowledge and connection within this project—while the position of the visiting artists as observers, have the privilege of distance to offer fresh perspective. This project has big ambition and zero funds; and it can only come about from the generous contribution of the community (in Kaliurang and in the art scene): the people who shared their personal stories, those people who are generous enough to share their time interpreting oral histories from one of the oldest member of the community; the people who let us use their personal infrastructures, spare land, hotel lobby, restaurant, and volcano observatory office for project presentation site, and the families who invited the artists to join the dinners and lunches every now and then. My root, as one of the member of the society, soon translated into an asset— a non-monetary capital of infrastructures that does not belong to me. It is something that I would take for granted until someone pointed it out and call it by its name. It was not only because to contribute something to the project gives them a sense of belonging to the project; but also, we share the same concern— an impulse to make a note, to remember, and to archive. For example, one of the oldest members of the community approached me the other day in a waiting room; he began telling me a long comprehensive story about his ancestors and the family line. He even offered to write them down for me so that I could revisit the notes one day. That was the first time I actually had a long conversation with him so I asking him why he would burst into sharing such comprehensive oral history with me; and he said, “Because I know you believe in nonsense and you care enough to preserve it”. For me, that is the least that I can do. A month after the exhibition finished, a question lingers: “What urged you to make this project?” Deep down, perhaps the answer was fear; or perhaps it was an excitement to share my fascination for the place; but, most probably, it was also an impulse to archive. As one walks around the 900mdpl exhibition site, the presence of the volcano feels stronger. If one is lucky enough to arrive in Kaliurang on a nice weather day, one will be graced by the majestic presence of Mt.Merapi in the background, with two hills which are believed to be Kaliurang village’s protectors. It is difficult to escape the majestic shadow of Mt.Merapi, breathing behind our necks. Sometime his presence is taken for granted, but most of the time it feels comforting, majestic, and strong. Instead of being scared, the natives understand the mutual relation between people and the volcano. Mt.Merapi is the most active volcano in Indonesia that has erupted regularly since 1548. It is one-of-16 ‘Decade Volcanoes’, worthy of particular study in light of their history of large, destructive eruptions and proximity to populated areas. Mt.Merapi is also an important volcano for the Javanese culture and is believed to be a mythical kingdom and the spiritual counterpart to the Yogyakarta Sultanate. The spirits of the good ancestors live in the palace in the mountain and occasionally visit their descendants in dreams to deliver prophecies or warning when the volcano is about to erupt. In Javanese cosmological symbolism, Merapi is one of three ruling ‘kingdoms’ within Yogyakarta; the three ruling kingdoms are connected through the sacred axis—from the northern point Mt.Merapi; the centre point the Tugu Monument and Kraton the Palace of the King of Yogyakarta; and the southern point the domain of the Queen of the Southern Sea. All of which are bounded in a mutual relationship between one another. Him, the Mountain, is personified because he is believed to be a breathing living being with conscience and will. What is seen to the eyes as lahar, lava flow, stones, and hot cloud are believed to be the troop of spirits that inhabited the great kingdom of Mount Merapi who needs to make their way to the sea every once in a while. Each time there is a major eruption, the people who resides near the mountain needs to give way to the spirits and move for a certain period of time. Each time an eruption occurs, the people who live at the slope of the volcano believe that the kingdom of Mt.Merapi celebrates—the eruption is considered as a process of rejuvenation, granting the people in the slope with ash rain that makes the land fertile. It was not until Mt.Merapi changed shape in 2010 has people started to fear him. Along with the changing shape and explosive tendency, Mt.Merapi feels foreign and threatening. In the big eruption in 2010, 320,000 people were evacuated from the dangerous area and the death toll was more than 350 casualties. The aftermath left many villages burned down and buried in ashes. For the first time in many years, the volcano triggered paranoia among people with such a real threat and danger. The sense of impermanence is getting stronger; especially in populated places that has proximity to the crater. Kaliurang, 8 kilometres away from the crater, is pulsing with a silent sense of temporality. This was the starting point of my impulse to archive the stories of the people, the specificity of the sites, and the collective memories. What does it mean to create an art project under the volcano? For the artists, it meant immersing themselves in a strongly bound of community that has been shaped and reshaped through reappearing temporal communities where kinship and affinity get stronger each time the volcano erupts. For me, it is an act of returning. It is inevitable that the topics of nostalgia, community, collective memory, tourism, non-monetary trade, and the volcano are reoccurring and colliding within this project. Some visible elements such as tourism, the volcano, and the daily life are the starting point to tell the story about Kaliurang. Thus, the route is chosen. A major landmark needs to be the starting point of the project, but not in a way that the tourism become the centre of it. Taman Rekreasi Kaliurang, a park located in the centre of Kaliurang, is one of the major attraction. But choosing the park to be the starting point will be giving too much emphasis on the tourism industry. The starting point needs to give the same emphasis on tourism and the daily life of the people. That is why an old shop, just a few meter away from the park, is chosen as the starting point. The shop has been running since 1930. Before it functioned as a shop, the land belongs to a member of Yogyakarta’s royal family who then give it to a family who are among the very first local people in Kaliurang. The shop which is also a home to the oldest family in Kaliurang, can be a starting point to talk about the history of Kaliurang, the politics of land ownership, and the daily life of the people. Like many of the house’s characteristic in Kaliurang, the shop then hold many different functions at once: a grocery shop, a hotel, a personal house, a restaurant, and now also an antique shop. A home in Kaliurang is almost always semi-private. The children of the family are taught to help with family business, sometime even not having his/her own room because the extra room in the house is rented to stranger; they are made to learn about hospitality since they were younger. The presence of ‘the other’ is becoming part of the daily life. As the audience walk through the exhibition route, this kind of home will be once again met in the third location: Vogels, a traveller hostel listed in Lonely Planet many years ago and become the destination of foreign backpackers ever since. The building itself was built circa 1930s, changed in function many times before a Japanese men decided to buy it, start a family who then start a business of backpacker hostel and volcano trekking. The connection between the village and the volcano reappears at the 8th spot in the exhibition route when the audience are invited to enter Pos Pengamatan Gunung Merapi (the Mount Merapi Observatory). A more subtle connection is silently present in the 2nd location, an abandoned piece of land that used to be a house of a mentally ill man who went missing in the sacred forest at the slope of Mt.Merapi. The story of the sacred spirit kingdom of Merapi is retold in a small room in a private home and a highlight on many abandoned places in Kaliurang are presented at the same time at location number 4 and 5. While the story of the people and the community are presented at a hotel lobby, a semi-open air space at the same hotel, and a place that used to be a shop by the street under a small hotel. All of which are presented in a loop, where audience will pass a busy street full of food vendors in front of the park, down to residential area that consist of a mix between private housing, hotel, and semi-private home, and back up to the first meeting point through the public facilities area where the community health centre, schools, as well as the exhibition’s public programs are located. To walk around the exhibition trajectory, a map and signs are prepared for the guest. But, throughout the exhibition period, most of the audience are visiting in a formal institutional visit or taking the offered walking tour with either the curator-guided walk or the artist-guided walk. What I realize at the end of the show is how dependent was this exhibition to have a presence of someone in the team as the exhibition guide. When the residency period put us in a position of a host for the artist by opening up my private home for them, the exhibition period put us in a position of an alert body—always ready to perform. It was a rather challenging and rewarding experience of resilience and endurance. Let us now take a walk around the exhibition’s route. The first location, Warung Joyo, is the starting point for the walk where the audience of the show can find the map, information, tour schedule, and information centre. On a cupboard in the restaurant area, the audience can find a video by Simon Kentgens projected amidst the antiquities and mundane daily object. The artist came with an initial question of whether or not a local shop can function as some sort of museum of contemporary relations? One in which these objects and stories are not fixed, like in a traditional museum, but constantly moving, changing and exchanging? Simon was the last artist to arrive in the residency all the way from the Netherlands. Unlike the other artists in this project; he created his work, preparing the show, and doing the short residency simultaneously. He then decided to work closely with the local owner of the shop and explores the shop as some kind of social space where not only products get exchanged, but also news, anecdotes, gossip, and history. Simon built the relationship slowly, starting by making a dry museum-like catalogue of the items being sold in the shop, the precious antique and groceries alike, and post it on instagram (http://instagr.am/warung_joyo). Simon came with a preconception about the shop as a meeting place for people and find it very lacking of social interaction in its day to day operation. Yet, the place is brimming with stories of the past. So he invite the family of the shop owner to join in his project, asking them to choose some items that they love the most amongst thousands of antiquities and why. The artist believed that no matter how trivial these objects sometimes seem to be, they can show us our interdependency with local and global economies, history, our neighbours and the world. But, it turns out to be much more personal than that. Warung Joyo is a shop that has been hereditary from three generations of the past. It has its moment. The jaded shop is now loaded with expectation and success story from the past on the shoulder of the owner who simply chose a quieter path with his love of antique from all over the world. So when the artist ask him to share the story behind his (and the family’s) favourite items, he was rapturous. To share his excitement of the things, it also means sharing the passion and the reason behind his quieter path, remembering meaningful relationship with the previous generation, and build a meaningful relationship with the presence. At times, the artist and the shop owner finds a connection between them through the items despite having language barrier. The video presented in the restaurant area then becomes a conversation starter and with events popping up in the shop, it is once again full of life. Few meters away from the shop, there is an abandoned land and a remnant of the house of a mentally ill guy who went missing in the sacred forest at the slope of Mt.Merapi three years ago, Lik Sigun. The family believed that one day he might return, so they keep the land. Just like how a sacred forest become the last vestige of a virgin forest because it often considered as a place inhabited by spirits; the remnant of Lik Sigun’s house is amongst the last plot of land in that area that remains being a green spot, untouched by all new buildings constructions around it. Someone who went missing in the sacred forest (Hutan Bingungan), is believed to be ‘needed’ by the spirit kingdom of Mt.Merapi and might sometimes be able to find his way home, at least in spirit. When the artist, Maryanto, found the location of the house remnant through an anecdote told by Lik Sigun’s neighbour, he decided to create an homage for him. He started by collecting anecdotes about him from the neighbour’s collective memories. It is important to understand to see the kinship pattern in such a closely knit society like it is in Kaliurang. A mentally ill person who is living in traditional community like Kaliurang is becoming an extended family and a shared responsibility of the neighbours who will make sure that he can live freely amongst the society. When Lik Sigun went missing, a tenacious search was done for him for over a year. A team that consist of a fully trained Search And Rescue (SAR) team, neighbours, and family members follows every lead and still there are no sign of his presence and then they stop looking, wait for possible lead, and remembers him through anecdotes about him. It was easy for Maryanto to collect the stories from the neighbours because they tell the stories amicably with humour, wonder, and wish that more people will know about his story. Taking on his own method in painting, Maryanto let the grass overgrown the remnant of the house to later trim the weed and highlight the part where the ‘artworks’ made by Lik Sigun are hidden; creating a conceptual landscape of remembrance that can be enjoyed using a map of the objects. A few meters towards the recreational park of Kaliurang, the audience can find Mella Jaarsma’s works consisting of a performance (or its documentation video) and hot chocolate that can be made by order. The artist chose a place where she was a regular more than 20 years ago: Vogels hostel and restaurant. She knows the owner of the place very well and he remembers her as the lady who leave out photocopied pamphlets of an art gallery she run in the city: Cemeti. For the artist herself, Vogels is all about nostalgia: a home that reminds her of her grandmother’s house in the Netherlands, in an area that has cold fresh air, and where she can get a cup of hot chocolate that is made exactly like it is in the Netherlands. During colonial times, the Dutch were creating settlements in mountain areas to escape the tropical heat. They build their second houses in Puncak, Lembang, Munduk, and also Kaliurang. Up until now we can find Dutch architecture and other recognizable traces in these areas. Vogel’s building is one of the trace of it. For the performance, one of the owner of Vogels come and join her to make hot chocolate for the audience while chatting about the past, the chocolate making preference, and about how Kaliurang is not as cold as it was (that she needs to bring a fridge so that people can experience the cold sensation and hot effect of the chocolate) . For Mella Jaarsma, the hot chocolate has transformed into a trigger of memory, just like Proust’s madeleine cake. How the hot chocolate triggers a memory for Mella is unique for herself, yet, she is willing to share it with other people as an illustration of the story, a residue of the performance, and a monument of nostalgia about home and the past. Even after the performance, the audience can still orders Mella’s style hot chocolate in Vogels to turn it into a shared experience of the place and the taste. Walking on the busy street full of street food vendors and tourists by the recreational park, the audience will then find an old tennis court that has turn into a parking lot. From there, the street become more narrow and calm as they are entering the residential area. In one of the private house’s garage, there is a video installation by Sandi Kalifadani who organize a participatory secret gig called Walk the Folk (WTF) around Kaliurang since 2014. Kalifadani was among the first artists I invited to respond to Kaliurang as a space. Taking up on his position as a musician, he decided to make a gig where stage is shared between all audience and people are invited to exchange not only music performance but also stories, poem, coffee, and service among others. As a local ‘guide’, it was my duty to choose the path where the participants will walk to. In WTF #1 (2014), we occupied abandoned public spaces around Kaliurang; WTF #2 (2015) occupied abandoned private spaces; and WTF #3 (2015) occupied local community’s gathering spaces. When looking at the video documentations presented in this exhibition all at once, one can trace the changes in the landscape and politic of spaces in Kaliurang from 2014 to the present time: half of the tennis court has been transformed into parking lot, a beautiful old house was torn down and changed into a big concrete building, the once-abandoned swimming pool where is now back to business, and many more. The temporality of the place is omnipresent in a place under an active volcano and presence of a new generation. Walking further into the garage area, the audience can find a small carpeted room that smells like talcum powder and eucalyptus, and looks like an indoor camp of a child’s making. Dimaz Maulana is a historian who decides to do a small research about the genealogies of the people in Kaliurang and present the result in that small room that looks like a shared childhood experience of fantasy storytelling session. At the beginning of his residency, he starts collecting pieces of collective memory, myth, local stories, while at the same time tracing the genealogy back to the first person who turn the forest under the slope of Mt.Merapi to a village. Those oral histories are collected from one of the eldest member of the society with a memory of an elephant, combined with local bedtime stories. Those stories are later transformed into soundpiece and a room installation; combining local wisdoms, beliefs, and fantasy. Within this realm, he himself turns into an itinerant storyteller, taking the audience to a different moment in time every other time. At the end of 2013 until 2015, Dito Yuwono initiated a project titled "Recollecting Memories: Tukang Foto Keliling (Itinerant Photographer)” as an on-going research project, focusing on tracking the practices of tourism photography in Kaliurang. Dito first started the project due to his curiosity when he meets the man who was seemed to be the last itinerant photographer standing in Kaliurang: Mr.Dasri who started to work as an itinerant photographer in the 80s during the heyday of Kaliurang. What was started out as a business later becomes his passion. Dito then started to follow him around and they soon become friend on a mission to find the rest of the photography group. His first attempt to seek for a narrative of these itinerant photographers was done by creating an exhibition for them. In searching the physical artefacts and relics on the Kaliurang Photography Group’s heyday, Dito found a grey area that is somehow similar to their memories: a bit faded and mixed. Photo materials are brittle, the humidity caused loss or damaged photographed, there was no catalogue system, and there was no awareness to properly store the photo to ensure its durability. At the end of the year, Dito acquire the achieves and put them together as a whole story about the informal group of itinerant photographer in Kaliurang. He uses the term "Kaliurang Photography Group" to refer to those who became itinerant photographer in the Kaliurang between 1981-2005. Their engagement in this 'group' is limited to the form of the distribution pattern of Polaroid products with no attachment. The connection that unites them was unofficial, voluntary, and organic. Through this history of itinerant tourist photography practices, not only can we get an overview of the economic aspects of tourism specifically in Kaliurang, but also learning about the history of the region, the social relations between the local and the newcomers, the political power that works in the realm of photography. Aside from personal aspect of this projects, there are findings on the New Order’s tourism campaign (Kampanye Sadar Wisata) when photography was supported by the state; the fall of the Polaroid industry; and the rise of digital technology. The project is presented in a familiar and non-exclusive environment: a hotel lobby (location number 6), where the photography group first met on a reunion organized by the artist in 2014 as a tribute to their 30+ years of practice and in the spirit of creating an achieve about their presence. Just next door from the hotel lobby, Anggun Priambodo shows his work in a semi-outdoor dining room of the same hotel. When Anggun Priambodo decided to stay in Kaliurang for two consecutive weeks, he opens up himself for any opportunities that came his way. He started by creating his own ritual of morning walk, doing the chores, drinking coffee on the porch, writing, reading, and interacting with the locals. He wanted to be part of the community. Later, Anggun stays for more in Kaliurang, going back and forth from Jakarta to Yogyakarta. His presence starts to get a special place in senior citizen’s and children’s heart in Kaliurang. His presence in the community is transient, thus, it amazes him to see how closely-knit the community is. He considered that this special closeness of the Kaliurang community could be the result of living together under the continuous looming danger of the volcano. Yet, in spite of danger, it is the comfort of living in Kaliurang which keeps people coming back, resulting in longstanding composition of inhabitants. Soon enough he made new friends while responding to different interactions by producing new artworks for what he later refers as his ‘solo exhibition’. In no time, he start mimicking local activities by trading handmade walking sticks, volunteering on the afternoon school for senior citizens, creating an acting class and a walk as requested by them, and get himself involved in the local’s endless attempt to promote the area. All of which are wrapped into a show called Anjelir, musing on a song with same title written by a local activist for Kaliurang elderly while putting the elder member of the society back in the spotlight and archive their presence through playcard called ‘Gambar Umbul Kaliurang’. Eva Olthof choses to present her sound installation inside the office of the volcano observatory in Kaliurang. ‘If Merapi tells us to go, we go’ (2017) comprises of a montage and stacking of interviews, field recordings, ads and handy talky sounds compiled between 2015 and 2017 on Mt.Merapi. No matter how dangerous the volcano can be, the people are keep on coming back and this recording is one way to try to understand why. Listening to it, you tune in and out to stories related to life on the mountain. The sound piece is also a way to understand the relationship between sound, community-run radio station, temporal community, and the disaster. To make a complete loop from this point of exhibition venue to the next, the audience will be guided through a walk up the street where the school, community health centre, public program venue, and an independent community-based radio station is located. The route ended with Edita Atmaja’s plant barter shop in a now-abandoned room that used to be functioned as a plant shop few years ago. The shop is located by the streets where the neighbours are walking by. Edita continues her research from the residency in Kaliurang conducted two years ago. She took a longer stay this time to further immerse inside the community. During her first residency, she collected information about several well-known types of vegetation that were indigenous to Kaliurang and how it interconnected with the locals. When she starts tracing the passage of the plants, she vaguely saw a plant circulation map brimming with human touch. This distinctive dissemination pattern portrays its communal connectedness. As the result, she discovered an exceptional bond between plants and the people of Kaliurang. Instead of finding the formal dissemination of the native plants, she found out how unreserved the way people in Kaliurang socialized and exchange with their neighbours. This time, Edita tries to simulate this exchange by preparing a non-monetary trading space called “Taman Tukar” (Swap Garden) especially to accommodate people around Kaliurang to meet their neighbours, exchange domestic plants, and share information about them. All the information of where the plants comes from and its type are documented and openly displayed for public access. In this exhibition, walking is a crucial method of spatial practice. For the audience, walking is the act of activating the place and turns it into a space of experience: weaving together the narration in each sites presented by the artist. As you walk along, you would feel the tempo, the pace of time, and the stillness that this project requires: to create and to fully enjoy. You can spend hours and hours with the artists to talk about the work and everything else in between. Time, is a funny thing. It is somehow feel like it was stretched out to form a longer and thinner surface. And sometime in Kaliurang, time seems to be abundant but transient. It is the transience that requires us to keep a meticulous notes and add it up as a tool to remember. This is only the first step on a long and slow walk ahead. 900mdpl is projected to be the seed, planted to create a continuous platform of a site-specific art project in Kaliurang, offering a space of possibilities. Time will tell weather or not it will grow. i/The previous version of the note, version 1.0 was published online as a text contribution to Natural Capital online publication in htt[://naturalcapital.online/revisiting_the_long_slow_walk_to_900MDPL.html , The version 2.0 is an updated version of the text with addition on project evaluation and other thoughts.